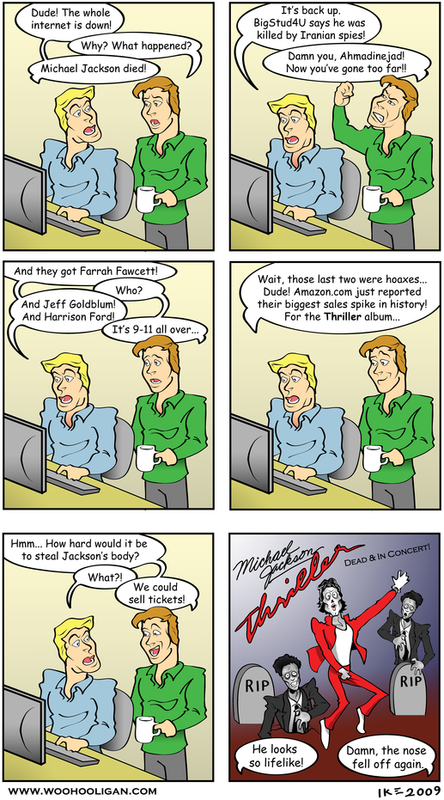 You're probably already aware that Michael Jackson died on Thursday (June 25, 2009). I tend not to pay much attention to these kinds of events. But what did pique my interest was the impact his death had on the internet. So much so that I heard a rumor that his death severely impaired the ability of Iranian Twitter users to send information out of Iran whilst still in the midst of their tragic and bloody revolution. My heart goes out to them, while my mind searches for a bit of humor in difficult times. Something you may not be aware of is that Billy Mays died a couple days later. I posted a follow-up cartoon in which Mays pitches Jackson to Saint Peter at heaven's pearly gates.